Seb Morris was fast at Monza, but it was to be a frustrating start to the 2019 season for the Wrexham-born driver. 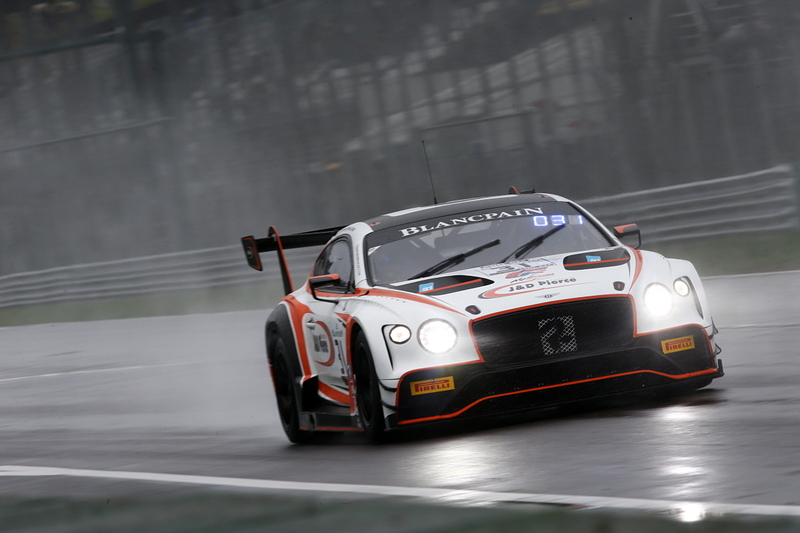 Rain-hit Monza provided the venue for an unbelievably frustrating start to the 2019 Blancpain Endurance Cup for Bentley Continental racer Seb Morris over the weekend, when a luckless early-race incident involving team-mate Derek Pierce led to a vexing retirement. Everything had started superbly for 23-year old Morris and Team Parker Racing during practice at the Italian track, the Wrexham-born driver lapping third quickest in the Pro-Am class on Saturday morning, fifth overall, and notably out-pacing the two ‘factory’ Bentley entries. With confidence high for the 90-minute Pre-Qualifying session later in the day, BRDC Superstar and Motorsport UK ‘Team UK’ driver Morris continued his sensational level of performance with third fastest in class again, only a couple of tenths of a second shy of the Pro-Am pace. Once again, the Welshman was quicker than the works Bentley cars to conclude an extremely satisfying day and hopes for Sunday’s final qualifying session and, by extension, the race itself were justifiably very high. Unfortunately, race day was where everything went badly wrong for Team Parker. Rain arrived, as had been expected, and Pierce took the first of the three qualifying sessions. Even though the run was impacted by two red flag stoppages, the Scotsman ended up third in Pro-Am. For session two, with track conditions treacherous and rain continuing, Rob Smith headed out looking to keep the No.31 Bentley in the top three at least but an unfortunate moment at the Ascari Chicane, and subsequent contact with the barriers, ruled the car out of the remainder of qualifying and meant Morris wouldn’t be able to take to the track in the decisive third session. Tasked with a major challenge to try and repair the frontal damage sustained to the car with just four hours to go until the race itself, the Team Parker mechanics set to work and produced a monumental effort to have the Bentley ready just before the race start at 15.00 local time. Again, the track was very wet for the race with rain continuing and so officials began the three-hour encounter behind the Safety Car. The team opted to start from the pit-lane, which was definitely the sensible decision, and Pierce took to the track for the first stint. Making good early progress, Pierce climbed through the overall order while still holding seventh in Pro-Am but on lap seven he had to return to the pits after a tangle with one of the Ferraris heading into the braking zone for the first corner, the Rettifilo Chicane. Such was the extent of the damage, the Bentley had to be retired from the race. “It isn’t the way we wanted to start the season, obviously, but we were able to show fantastic pace in practice and qualifying and I was very happy to be the fastest Bentley driver out there,” reflected Morris. “We definitely had the speed and the car to be on the Monza podium, but it wasn’t to be. Silverstone Grand Prix Circuit in Northamptonshire will host the second round of the Blancpain Endurance Cup season on 11/12 May. Before then, Morris will get his 2019 title bid in the British GT Championship underway at Oulton Park in Cheshire, this coming Saturday (20 April), and on Easter Monday (22 April) with the JRM Bentley squad.